Although I know there is much more to Cornwall and Devon than busy ports and sleepy fishing villages, tomorrow I head inland for the rest of my trip so I decided I should get my fix of the sea while I still could. I tossed up between heading east to Devon or west to explore more of Cornwall. West won, mainly because I had all the information I needed to get around and I've found the Ride Cornwall pass so convenient. 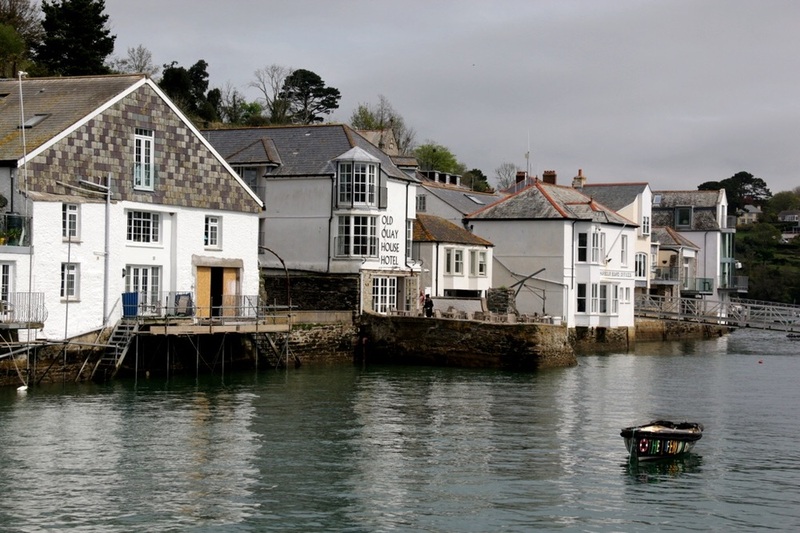 First on the itinerary was Fowey. It looked nice plus I had a recommendation from a friend. I took the train to Par and then the 25 bus to Fowey. Once again, the bus stopped at the top of the town and I needed to walk down a little way to get to the shore. The waterfront gave great views of Fowey and Polruan on the opposite side. I admired this floating advertisement. I walked around a bit. More narrow streets and alleys. On the way I popped into one of the many bakeries and bought a cream doughnut with caramel icing. Not my usual thing but they looked so authentic and traditional. Very delicious. I told myself the walking offset the calories but I'm sure the calories are winning at the moment. I also admired this display of seaside essentials for sale outside one of the shops. There was a coastal walk that I hoped would lead to St Catherine's Castle. My friend Adam had recommended it and it certainly looked like a good spot. Unfortunately I didn't take a great shot of it from the water front, but it was a long way up the cliffs. The walk there was lovely and got more beautiful once I left the road. But the view was well worth the climb. I slowly made my way back down again and had a delicious traditional Cornish pasty for lunch by the foreshore. It was 1:00 by this time so I decided to make my way to destination number 2. The next destination was Newquay on the north west coast. I had read that it was much bigger but I thought it might be a nice contrast. It's on the Atlantic too, which I find alluring for some reason. I caught the bus back to Par and then a train on the small branch line to Newquay. I got there about 3:00. The tide was out which made the beach super impressive. The bridge between these rocks was crazy. Overall though, I found Newquay a little underwhelming. Nothing stood out. The next train didn't return to Par until 5:22 so I had some time to kill. I found a pub with an outside area and a nice view. Then I bought some fish and chips on my way back to the station. I stopped in a park overlooking the sea to eat them. The fish was amazing but the chips were a bit soggy. The wildlife were certainly interested though. One cheeky bird swooped in an stole a bit of fish right out of the container. I had to guard my food after that. But some of the birds were very beautiful so I have to forgive them. And speaking of birds, I spent some more time today just listening to the chorus of bird song around me. Wonderful! The weather report for today had been mild - high teens. For the first time I went out without a jumper. Just t-shirt and jacket. By midday I had removed the jacket. Got a little bit of sunburn on my head though. That was unexpected. I've purchased sunscreen now for the remainder of the trip.